Have you ever met someone and just known that you were going to be friends? Have you met someone and known that you would have to work hard to understand them in order to like them? Do you feel yourself uplifted and energized by your social circle or do you feel drained, heavy-hearted or critical after a social event? Maybe you feel an incredible sense of peace around certain people, or perhaps others stimulate you mentally, engaging you in discussions about life, the Universe and wild theories within it. If you have experienced any of these scenarios and you cannot quite pinpoint the reason for feeling a certain way after various encounters, you are probably experiencing what is commonly referred to as a person’s “vibe”. In my personal experience, people operate on different frequencies of energy. Regardless of what your spiritual beliefs may be, there is no denying that humans emit a certain “energy” which is directly related to who they are as a person, as well as their emotional state in the present. This is something that is extensively researched in Psychology as humans continue to try quantify something which is difficult at best, to put into words. Energy is probably one of the most difficult concepts to explain. Just like with the concept of “feel”, it is only through awareness, complete relaxation and practice (with a particular sensitivity to feedback provided by the horse) that energy can be mastered. Essentially, as with feel, one’s ability to take charge of energy will be directly proportional to the subtle effect one can achieve when communicating with a horse, whether that be under saddle, on the ground or in a field filled with horses. 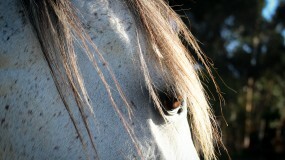 Horses feel our “vibes” and judge who we are without malice or forethought. Within a few seconds, they know whether they want to be with us or not and it is only through changing how we present ourselves that we can convince them to stay. This is an incredibly humbling experience for many equestrians, but it is also an opportunity for personal growth invaluable to anyone willing to learn. Just like we are all different, so too are the horses. This is often how instructor know within a few minutes of chatting to a person which of their horses would suit that rider’s personality. It is not only about skill – chemistry is everything. Grounded energy consists of a feeling of stillness, relaxation and contentment. 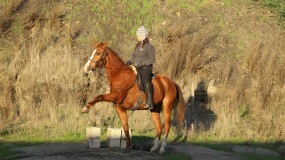 This is the starting energy level for any sucessful first encounter with a horse. Grounded energy is likened to a horse having a nap in the sun or grazing peacefully with not a care in the world. Grounded energy for a handler consists of deep, steady breathing, no physical tension and a clear, open mind, free of emotion or internal turmoil. One’s heart rate is slow and one’s body is softly aware, while not being overly busy. 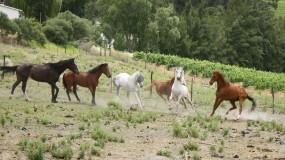 Pushing energy involves what feels to horses like a force of resistance. The intensity of the push can vary from the feeling of a pliable bubble expanding outwards to the feeling of a wall crashing down or a violent and loud explosion. This energy is created through movement and an inner picture of assertiveness or hurriedness initially and eventually becomes only a suggestion added to a thought. Drawing energy is an extension of connectedness which can only be visually likened to the way cartoons depict characters lured in by an enticing aroma, floating through the air, guided by their noses, as the gentle billows lead them to that magical pie in the window! 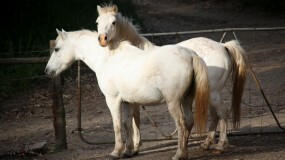 Drawing energy will not work if the horse does not have some basic trust of, or interest in, the handler. In order to draw, one has to become like an enticing aroma – sweet to the senses and full of promise. 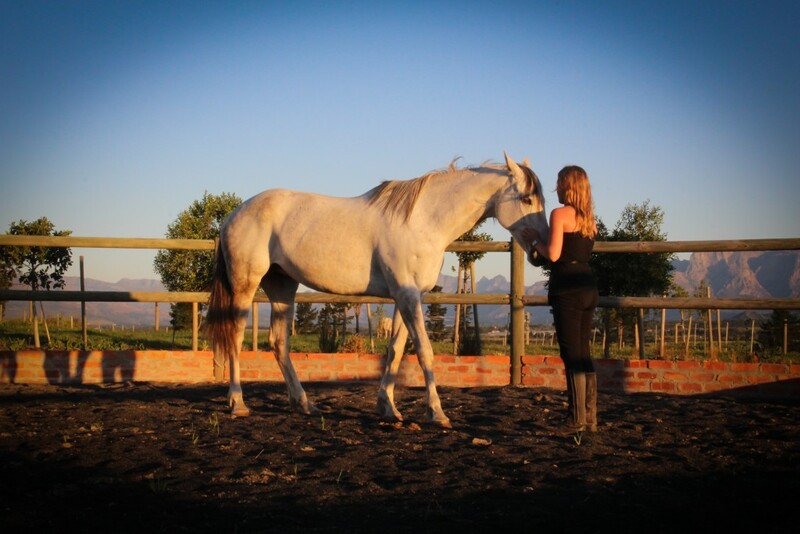 Adrenal energy is what one would experience when a horse is in pain, frightened or fighting for their life. It is sharp, abrasive on the eyes and presents in the shape of what we call “vices” or “bahavioural issues”. Adrenal energy is likened to jagged movements, fast reactions, a sense of urgency and hurriedness and minimal time to process the events of the present. Adrenal energy is instinctual energy, survival energy and coping energy. In training, this is what we try to avoid at all costs. It is up to us to understand the most subtle signs of an adrenal response and to address the cause in order to bring the horse back to a state of equilibrium before continuing work. This energy gives the feeling of getting a fright, tripping and falling or confronting someone in a hightened state of extreme emotion such as anger or depression. Adrenal energy has no place in the conscientious handler and horses cannot cope with operating under this energy for extended periods of time. We must never employ this energy when working with them! Horses are able to emit and receive these types of energy rapidly and their combined use of energy and body language is what forms the cornerstone of the equine communication. In order to understand horses so that we can better interpret their behaviour and needs, we need to form an acute awareness of energy and its use. It is important to not only know when a horse feels stressed, shut-down, overwhelmed, anxious or relaxed, but also what we are doing to influence their state of mind at any given moment. In mastering energy, one not only masters himself, but also draws closer to masterful communication with one’s horse – and is that not, after all, the goal of classical horsemanship? Previous post: Dial it Down! Thank you so much! Please let us know if there is anything in particular you would like to hear about.